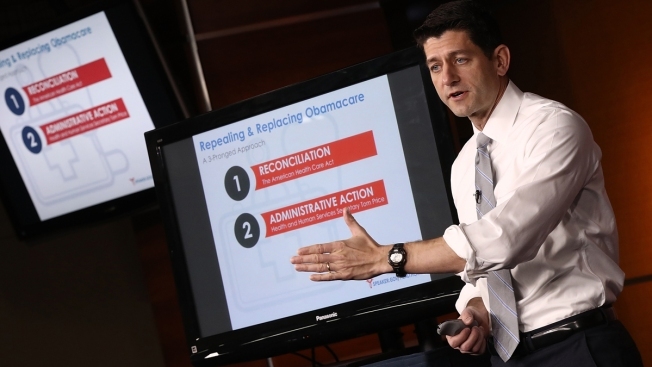 Speaker of the House Paul Ryan (R-WI) explains the Republican plan to replace the Affordable Care Act during his weekly press conference at the Capitol March 9, 2017. "We made a promise to repeal and replace Obamacare. Now it's time to do it," he said. A hundred or more people showed up at an emergency town hall meeting Sunday afternoon in Berkeley to stand against an effort in Washington to repeal the Affordable Care Act, a federal lawmaker said. The meeting took place at the Ed Roberts Campus at 3075 Adeline St.
About 3.7 million people in California gained health insurance when the law, also known as Obamacare, went into effect and state officials were able to expand Medi-Cal, California's version of Medicaid, according to Rep. Barbara Lee's office. Another 1.5 million enrolled separately in Obamacare. Lee is opposed to President Donald Trump's plan to repeal and replace his predecessor's work. "It would be devastating," Lee, D-Oakland, said by phone before the meeting. State Sen. Nancy Skinner and Assemblyman Rob Bonta were also scheduled to attend. Lee said low-income people would be hurt by the repeal of Obamacare as Medi-Cal would be cut back. Medi-Cal serves low-income Californians and people with disabilities, among others with fewer resources. Lee said Democrats have the support of some Republicans in Washington. She said right now Republicans probably don't have enough votes to pass a bill to replace Obamacare. She planned to speak Sunday to organize resistance to the president's efforts. "We're going to fight hard," she said.